Wonderfully dynamic and energetic representations of the ocean in all its temperaments, with crashing waves, roiling tempests, turbulent skies – and sometimes more placid states – in vivid forms and colors. 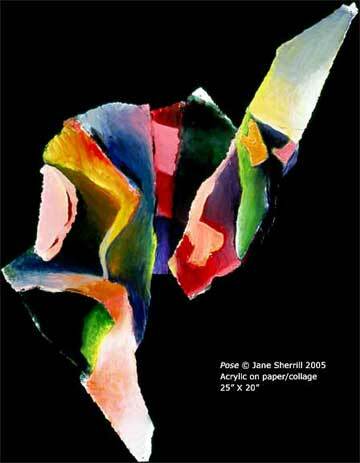 Jane Sherrill has worked in miscellaneous idioms over the years, always with a vivid sense of color and energy. Though sometimes exhibiting objective inspirations, Sherrill’s earlier work is dominantly abstract, frequently realizing strikingly playful and vivid rhythms of tone and shape. Whether inspired by flags, waves, or just by color and form themselves, Sherrill’s expressionist force is readily apparent. Inventive exuberance radiates from these pieces, each of which seems like a fabulous jazz solo. They really cook. 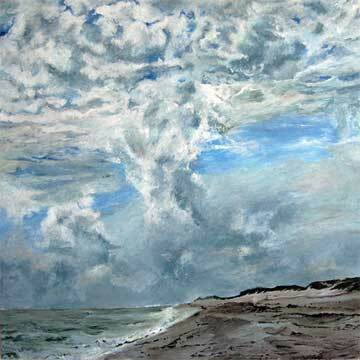 More recently, she has focused on more representational themes and has produced a series of works inspired by the sea. They have a naturalistic base, but convey equal doses of energy as the earlier, more abstract, endeavors. That energy transfer from abstraction to naturalism also performs an interesting alteration, allowing the potency to remain the same as the locus of energy moves towards ocean, beach and sky. This change of focus suggests an interesting alteration in stance, yielding not only an evocative urge towards energy through invention, but an additional dimension of reverence for the way in which energy can be drawn from the world itself. A precise seascape. Carefully shaped rills of sand touched by seaweed stand before the peaks of short dunes rimmed by scrub brush. A hint of light, pinkish, arises on the right, above which a vivid blue opening emerges. In the center, like a wild flamenco dancer in white, an explosive tower of cloud connects sky and earth in a vertical band. 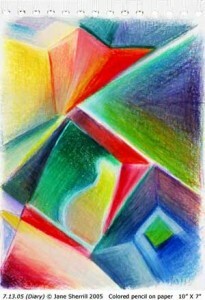 Like an erupting volcano, it feeds the lava flows of the textured sky which flowers into twists and ripples at the top. As the eye settles back down, the sea, reaching, in green, from the left provides a calm entrée to the sandy beach. White, blue, green and brown are woven into one another as land and sky shapes dance together, the central urge of their embrace reaching upwards from within.